1. Gift shop at the Country Barn Gift Shop. This store has everything from bear statues, t-shirts, magnets, pens to Minnetonka moccasins. The Country Barn is also conveniently located between the gem mine and the Three Bears so you can park and hit three places all at once and within steps of each other. I always stop and shop here when I'm in Pigeon Forge. 2. 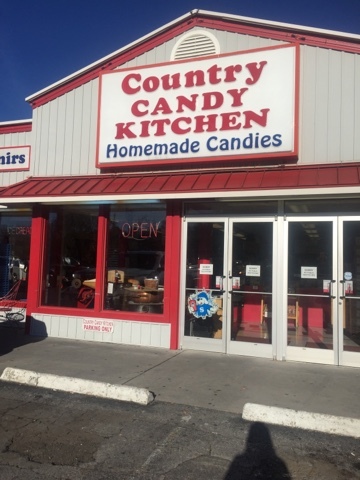 The Country Candy Kitchen. This place seriously has the best candy in the land. They have everything but my favorites are the chocolate covered peanuts, cashew clusters and the white chocolate dipped Oreo cookies. 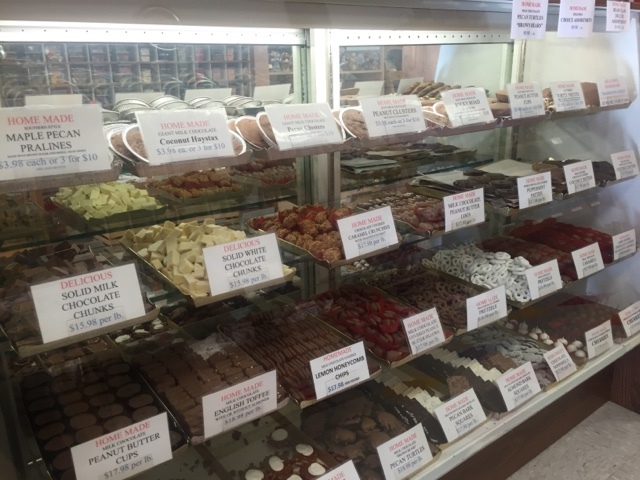 They also have candy apples, fresh made taffy, rock candy and of course fudge! The options are endless. I always end up leaving the store with a giant bag of sweet treats. I always go at the beginning of my trip so I can enjoy the sweets while I'm running around town then usually once more before we leave so I can bring the goodies home too. The largest Christmas store in the south also known as the mother ship calling all lovers of Christmas home. Not only do they have spectacular Christmas trees on display, they have massive Christmas Villages on display. The store also have anything and everything you could ever think of for sell that you would need to decorate your tree or village for the holiday season. They also have a rewards program and for every 250.00 dollars you spend you get 10.00 off your next purchase. I have been going to Hollywood Star Cars in Gatlinburg for years and they always have new cars to see in person. They currently have a huge line of cars from the Fast and Furious franchise. They also have classic cars from Twister, Batman, The Flintstones and more. They also have original movie posters and props on display. There are several cars that you can sit in and take a photo. Before going in they have several cars on display that you can see before going into the museum. Since I was 12 years old and Leonardo hit the screen in Titanic, I have been fascinated with the real events of Titanic. When Pigeon Forge dedicated a museum to Titanic I knew I had to visit it. I've walked through Titanic a few times and each time I learn and see something new. They have artifacts lifted from the bottom of the ocean and brought back to life. They also have a recreation of the grand staircase. You'll see photos that can't be seen anywhere else and since the museum has rotating artifacts if you go twice in a year you may not see the same items as the other visit. There is so many things to do and see in Pigeon Forge/Gatlinburg it could take hours and countless posts to tell you all about it. I didn't even go over the different dinner-theater shows that the town offers. The restaurants are also some of the best you'll find! So what are you waiting for? Get to town and start visiting all of these fun places!